Infantry Divisions are referred to as "Triangular" because they consist of three Battalions per Regiment and three Regiments per Division. Due to the shortage of men in most combat units in Occupied Japan, Divisions had only two Battalions per Regiment. The only exception was the 24th Infantry Regiment of the 25th Infantry Division. During the latter part of the Civil War, Congress had designated it as a "segregated" unit and as a result, most of the African Americans who were in the Army ended up in the 24th Infantry Regiment. All of the officers were white, hispanic or oriental. There were other segregated units, such as the Third Battalion of the 9th Infantry Regiment of the 2d Infantry Division, but no other unit had been so designated by Congress. As a consequence, the 24th Infantry Regiment had the normal complement of three battalions and its artillery units had the normal three firing batteries. The First Cavalry Division was the only Cavalry unit not converted to a standard Infantry configuration at the beginning of WW II. It was retained as a Horse Cavalry unit stationed in Texas until 1943 because the Government was afraid the Germany might invade Mexico and so attack our country from there. They did this because it was still a Horse Cavalry unit and because the topography in that part of the world had primitive roads and had topographic features which would not allow effective use of mechanized equipment. The horses were left behind when they left for the war in the Pacific. The War Department finally got around to reconfiguring the First Cavalry Division in March 1949 with the process finally being completed in April 1949. The Cavalry configuration consisted of two Squadrons (Battalions) per Regiment, two Regiments and a Brigade Headquarters Troop per Brigade and two Brigades per Division. There were five Troops (Companies) per Squadron. There were three rifle Troops, one heavy weapons Troop and a Squadron Headquarters Troop per Squadron. The First Squadron consisted of Troops A through D and a Squadron Headquarters Troop. The Second Squadron consisted of Troops E through H and a Squadron Headquarters Troop. With the conversion, the Troops became Companies and the Squadrons became Battalions and a Third Battalion was added with Companies I, K, L and M.
First, I want to present the reason for this entire project. Back in 2007 a friend gave me a book that he thought I would like. It was David Halberstam's "The Coldest Winter - America and the Korean War". Shortly into the book he made a comment about the lack of training of members of the Japanese Occupation Army. Having spent from April 1947 through early November 1949 as a member of that group, I knew that his statement was in error. With the issuance of Eighth Army Training Directive #4 on April 15, 1949, which placed training for Combat as one of its primary purpose, the easy occupation life was replaced with an emphasis on being "Combat Ready". As a member of Headquarters and Headquarters Company, Eighth Cavalry Regiment, I spent from mid May thru early November 1949 at the training facility at Camp McNair on the slopes of Mount Fujiyama. Various elements of the Regiment came to Camp McNair for exercises with other elements of the Regiment and also other elements of the First Cavalry Division, such as artillery and armored units. A picture which I took while there appears below. I have read at least parts of most of the 20 or so books written about the Korean War. I found errors in all of them, with the most errors, (about 300) in David Halberstam's book, I think partly because is was the latest and he accepted as fact writings of previous authors and partly because he had a tendency to create facts which existed only in his own mind. Reading that book and doing the approximately three years of research needed to correct those errors led to my publishing my book "The Korean War Fiction Versus Fact". The error common to most of them was that the men were not trained. For details of the actual facts, see the book "Combat Ready? The Eighth U.S. Army on the Eve of the Korean War" by Thomas E. Hanson, number 129 in the Williams Ford Texas A&M University Military History Series. All of the following books had at least minor errors. Roy Appleman's "South to the Naktong, North to the Yalu" has the most errors after David Halberstam's book, partly because he didn't wasn't sent to Korea by the Army to write an official history until 1951. He did not properly check facts, did not carefully proofread his material and he took, without verifying the facts, what he was told by others who were there from the beginning. Other books with minor errors are: Keyes Beech in "Tokyo and Points East; Clay Blair's "The Forgotten War"; Bruce Cumings' "The Roaring of the Cataract" and "The Korean War-A History"; T.R. Fehrenbach's "This Kind of War; Joseph Goulden's "Korea, The Untold Story of the War"; David Halberstam's "The Coldest Winter - America and The Korean War"; Max Hastings's "The Korean War"; Robert Leckie's "Conflict"; General Paik Sun Yup's "From Pusan to Panmunjom"; General Ridgeway's "The Korean War"; Spencer Tucker's "Encyclopedia of the Korean War" (primarily because he includes articles by others who recorded inaccurate information); James Stokesbury's "A Short History of the Korean War" and Michael Varhola's "Fire and Ice". I began researching Korean War facts when I was working in my book, referenced above. I have made about ten trips to the National Archives facility in College Park, Maryland beginning in 2007. I spent about 6 hours a day doing actual research and have spent a total of 40 days there. I spent over $200.00 on making copies on their equipment on my first trip. After that, I used my camera and a flatbed scanner to make copies. I also purchased copies of Army Map Series topographical maps of Korea produced during the period 1947 thru 1951. I have copies of about 15,000 documents, the originals of which are filed at College Park. I have also spent a total of about 30 hours researching and copying about 2,000 documents on file at the U.S. Army Military History Institute at Carlisle, Pennsylvania. They have, among other things, all of the notes Roy Appleman used to write his "South to the Naktong, North to the Yalu" and "Ebb and Flow". They also have thousands of pages of questionnaires which were completed by Korean War Veterans, including narratives of some specific battles as seen from their perspective. 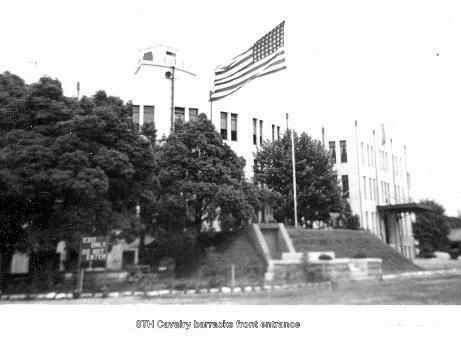 From April through November 1947 I was assigned to B Troop, Eighth Cavalry Regiment stationed at Camp King, Omiya, Japan which is about 35-40 miles away from Tokyo. The following story reflects some of the effort made to make Occupation troops combat effective even though, at the time, our primary mission was occupation duty. Shortly after I arrived, one night after lights out, we were all awakened, told to get our field and combat packs, report to the armory, draw our weapons and ammunition, go to the supply room and draw two days (six meals) of "C" rations. The "C" rations immediately went into our combat packs because when we were in actual exercises, we would leave our field packs behind and have only our weapons, ammunition, combat packs, entrenching tool and poncho with us. 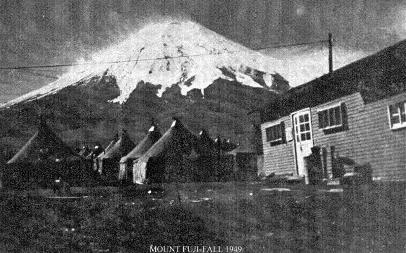 Within an hour of being awakened, we had had roll call and were all in formation beginning our all night march to the training area at Camp McNair on the lower slopes of Mount Fujiyama. We spent two full days of simulated combat training, during which time none of us got over about five hours sleep. Before leaving, we cleaned up the area and filled in all of the rifle pits and fox holes that had been dug during the exercise. Then about dark, we began our overnight march back to Camp King. On the way back, we had to clear the road so a Field Artillery battery could pass. Our platoon split in half, with two squads moving to one side of the road and the other two on the other side. I was in a squad on the edge of the road and I stepped too far back and my left foot went knee deep into a rice paddy (fertilized with human and animal waste). I had to march for about an hour with that paddy water in my boot until our next ten minute break before I could take off my boot, shake the liquid out of it and put on a clean dry sock. After we got back, I got rid of that boot, both socks and fatigue pants as I could not get rid of the smell. A picture of a combat boot appears below. Before I was transferred in November, we went thru a similar exercise except that this time the cooks were involved. At daybreak they had a field kitchen set up so that we had hot reconstituted scrambled eggs, hot coffee and hot "SOS" (chipped beef in gravy on top of toast). We also had reconstituted powdered milk. 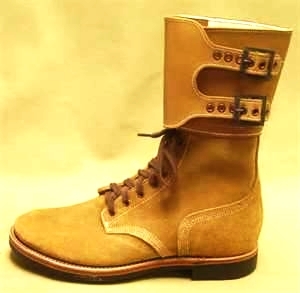 Below the picture of a combat boot is a picture of two farmers with "Honey Bucket" wagons. 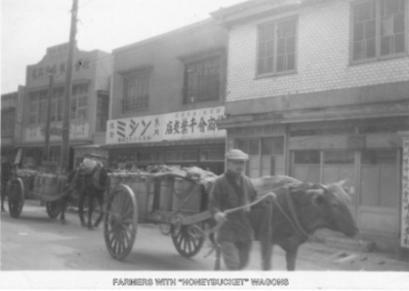 The wooden tubs were filled with human waste picked up in towns and villages. No sewage plants or septic systems necessary! From November 1947 through March 1949 I was assigned to Headquarters, 2d Cavalry Brigade, 1st Cavalry Division. I was first assigned to the Personnel Section, then transferred to the Intelligence Section. In early 1949, the Personnel Sergeant, Master Sergeant Frederick Pohlman was recalled to active duty at his temporary wartime rank of First Lieutenant and Captain Jeff Clay III was recalled to duty at his temporary wartime rank of Lieutenant Colonel. With the conversion in March/April 1949, the Commanding General of the 2d Brigade, General Herren was without a job, so for the short period of time before he was scheduled to return to the U.S. and his next assignment, General MacArthur created the "Tokyo Area Military Headquarters". Lt. Colonel Clay was designated his Adjutant and I was their clerical support. We were both assigned to Headquarters and Headquarters Eighth Cavalry Regiment on Temporary Duty assignment to the Tokyo Area Military Headquarters. This assignment lasted about a month until General Herren left to return to the U.S. In the middle of May we all packed up all of our non-combat related belongings, which were then locked up in a storage room in the barracks. (The barracks was located adjacent to the Imperial Palace and was used up until the end of the war by Imperial Japanese Marines, whose duty was to protect Emperor Hirohito). Picture of front of the barracks area appears above. We took all of our combat related gear and went to Camp McNair where most of Headquarters and Headquarters Company remained while various portions of the regiment and other Divisional units such as Artillery, Armor and Engineers operated in conjunction with each other for shorter periods of time. I returned to Tokyo in early November, picked up all of my other possessions and boarded the U.S. Army Transport General O'Hara. We sailed from Yokohama and I spent Thanksgiving Day in the mid Pacific. I was discharged in time to reach my parents home on Christmas Eve 1949.